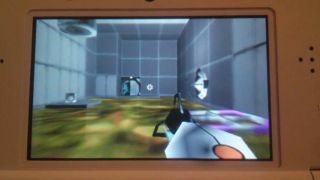 Here's Portal running on a 3DS because why not? Whenever game developers fall short, you know there's going to be an intrepid amateur hacker around to plug the gaps. Step forward code wizard Smea, who's managed to get Portal up and running on a Nintendo 3DS. By "up and running" we of course mean pootling around on some of the levels - this isn't a full game that you can load up and play quite yet, but it's impressive nonetheless. Prior to this, Smea managed to get the game working on the older DS handheld. "I'm not yet sure what my future plans are for this game," says the programmer. "I'd love to make it into the full game it deserves to be by implementing more gameplay elements, improving performance and getting some higher res assets in there." If this sounds like the kind of project you'd like to invest time and effort in, then you're in luck - the source code has been posted online so you can dive in and offer some assistance.